I realize that struggling to hang curtains on large bay windows with too much light is a very #blessed problem to have. But if you have ever googled "how to hang curtains over bay windows" and come up very, very, short, this post is for you! These shades looked very pretty when they were raised, and I like how they didn't detract from the molding around the windows. I bought these shades four years ago from Hot Blinds when I moved in. I love Hot Blinds. They have a crappy website but amazing customer service (they are lovely over the phone/email) and they make very nice, inexpensive custom shades. Custom shades were essential in my case because my windows are far from standard size (they're 30 inches wide and almost 70 inches high). This is probably true for you too if you live in an old house. I think each shade from Hot Blinds was $120, a steal considering most custom ones that size are closer to $600 -- per shade! I highly recommend Hot Blinds if you're looking for pretty Roman Shades for a very specific window size. I used them in Kevin's apartment here, where they look great. I had always thought curtains would be a better solution, since they would cover the entire window and not leave any gaps for light to stream in. Plus, I was kind of tired of opening and closing three shades every day, and I thought sweeping aside curtains would be easier. Lazy, but true. Finally let's be real, I love a project. So I went looking for blackout curtains. Before we begin, let me get on my soapbox about short curtains. Emily Henderson has an excellent blog post here with Curtains 101. She lays out your options for curtain length, and everything in that post applies to bay windows too. TLDR, the greatest possible crime in life is to hang too-short curtains. Please don't do it. It's very bad. 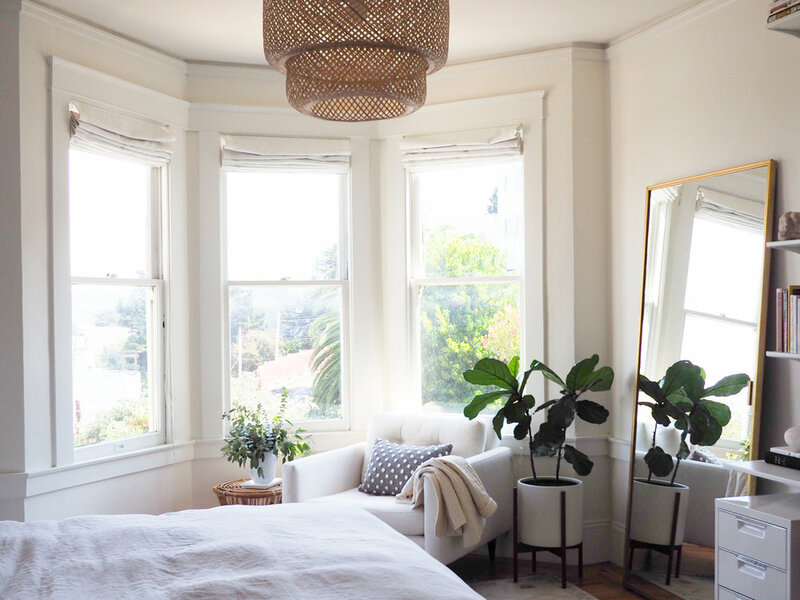 As Emily outlines, your three options for curtain lengths are to have them lightly "float" above the floor, "kiss" the floor, or "puddle" on the floor like you live in a romance novel. Kissing the floor is hard to get right, and puddling seems wildly impractical with dust, so floating is where most of us aim. You need to measure the approximate length of your curtains and then add several inches before shopping for panels. I bought beautiful linen curtains that I thought would work, only to put them in the wash and watch them shrink six inches in the dryer, making them too short for my windows. It's much better to buy long curtains and hem them than have them hang too short. I needed curtains that were 106" long, which was limiting. For instance, I loved these Pottery Barn curtains which come in 108" length with blackout lining, but I wasn't looking to spend $260 per panel (since I needed four panels). So I ended up buying the Ikea Ritva curtains, which have somewhat of a cult following. They're $35 per pair, and they come in 118" length. Let that sink in! You could buy 15 pairs of Ritvas for a single pair of the Pottery Barn curtains. I'm still thrilled. Something I didn't consider at the time, that I wish I had, was that you can very easily dye Ritvas. Jenny has a tutorial here where she dyed them yellow, and I think a pale grey could have looked pretty in my room. The primary reason bay window curtains are challenging is the rod layout. No two windows have the same angles, so it would be impossible to mass-produce angled curtain rods that would work for everyone. I'm sure you can buy a custom curtain rod, but that sounds expensive. Ikea used to make a curtain rod set that had bendy corners you could adapt to your angles -- it was in their "Hugad" curtain rod line -- and I started out using it in this project. But by the time I came to write this post, Ikea had discontinued it online, and I can't say I was surprised. It had flaws. This layout means you can't ever sweep all the curtains to the side of the windows, since the brackets prevent the corner curtains from moving. But I'm not sure how you could avoid this without a custom rod. In the end result, it doesn't bother me. The tools you'll need include: a drill and drill bits, Phillips head screwdriver, screws (that fit through the Betydlig brackets), level (I should have used this but didn't), ladder, and a hack saw (I bought this one on Amazon much to everyone's amusement on Instagram). And finally, if you want blackout curtains, you'll need lining material -- I got 12 yards of this fabric on Amazon, which was a good deal at $4 a yard. In total, the materials cost me about $180. This is still less than the price of a single Pottery Barn curtain panel, so I feel like a king. You use the rubber strips to line the curved rod supports, which keeps the rod from moving. And if you have room to slide it on, the white plastic cover slides over the bottom of the bracket so you can't see the screws. Pretty clever. You should hang the curtain rods as close to the ceiling as possible (usually many inches above the window) because it draws the eye up and makes your ceilings look taller. I mounted my brackets as high as they would go, touching the ceiling molding, since there isn't much wall space over my windows. Chances are good that the Ikea rods aren't the exact size of your windows, and that's especially true for your middle rod. Turns out, they are very easy to cut to the size you need. Note that I recommend buying the longer curtain rods Ikea sells and cutting them to the size you need instead of using them as extendable rods, as Ikea intends. When the rod extends, there is a sleeve where the two pieces connect, and I've found the curtain rings get caught on this sleeve. I found it was easiest to figure out what length I needed to hem the curtains simply by hanging them and then measuring once they were up. The exact length will depend on the height of the curtain rods and length of the rings and clips, and this seemed hard to calculate. Do it yourself: I have zero sewing skills but I was fully capable of hemming my curtains (see the photo of my handiwork below, lol). I watched a YouTube video, put on a movie to entertain myself, and it took me about 45 minutes per curtain. This option is free and doesn't require any tools except a needle and thread. Plus you will feel like Betsy Ross. ***Note: I had planned to have my favorite local seamstress line and hem the curtains, but she didn't write down the measurements, forgot to hem the curtains, and wouldn't correct the mistake. It was an unfortunate situation that put me in a cranky mood, and a good reminder to always ask to see the measurements and instructions written down before you leave material with anyone. If you want blackout curtains, you have to line the curtains as well. Your local seamstress or tailor should be able to do this. Mine charged me $45 per panel to line and hem, which felt very reasonable (had she actually done both). I dropped off all the curtains plus the lining I bought on Amazon, and it took her two days to finish them. Once your curtains are hemmed, you can hang them up and you're done! Ultimately I'm so happy with how they turned out. They're much easier to open and close than my Roman shades, and my room is pitch black in the middle of the day when the curtains are drawn. I like how the blackout lining makes the curtains thicker so they drape nicely, too. Got questions for me? Leave em' in the comments or ask me on Instagram! Note: This post contains affiliate links so I may receive a small commission if you like one of the items I recommend. Thanks for your support!